With the invention of “Price Match Guarantee” by today’s top retail outlets and the sheer amount of pricing data available online, consumers are less concerned about price and more concerned with how they will be treated by a dealer before, during and after the sale. Fortunately for the consumer this information is also readily available online and those car dealers who are not actively monitoring their online reputation will undoubtedly be at a considerable disadvantage. Call +44 (153) 660-9566 today and find out why so many dealers trust Autoxloo to manage their online reputation. 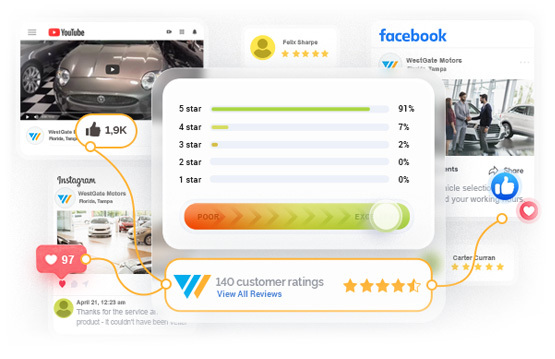 Utilize “real” testimonials to drive negative reviews down and/or if possible off the page(s) on a daily basis (1 review added per day per site). Restore consumer confidence in dealership – “Name” “Brand” and “Service”. Thank You, for using Autoxloo service.